I titled this photograph "Make a Joyful Noise" because it reminds me of the saying and a Precious Moments statue that my Mother had when I was a child. Can you hear her squeal? Can you feel her happiness when you look at this portrait? I have a whole series of photographs of this tiny little girl wearing her big sister's hat during their family portrait session. 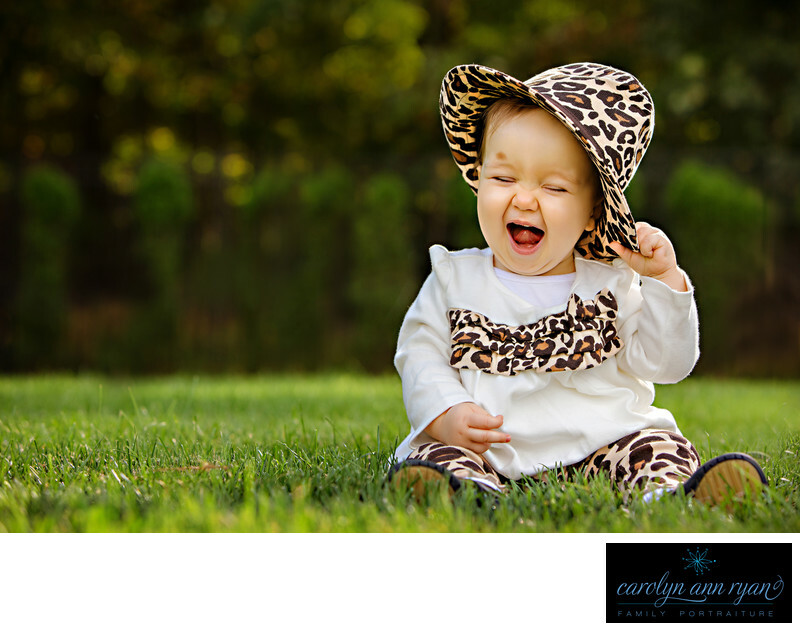 We have everything from the hat covering her eyes but still showing her smile, to looking sideways and seeing her beautiful blue eyes, to this photograph - the ultimate excitement filled squeal of joy! I used this photograph on my poster announcing the opening of my portrait studio because it completely conveyed my level of excitement. (I have another photograph of a little girl crying on Mom's shoulder that would convey my sadness when I discovered that I would have to close the studio to relocate to Charlotte, NC for my husband's job - but that story is for another caption).I love the squeals from a happy little one. They really do make the best and cutest noises. Whenever I need to cheer up, I just need to see photographs like this one. Smiles always follow. Keywords: Autumn (117), brown (18), Charlotte (9), child portrait (3), Fall (129), giggles (105), girls (165), ivory (18), neutrals (21), north carolina (78), Tan (18). 1/250; f/4.5; ISO 160; 85.0 mm.